Disclaimer While all precautions have been taken to ensure the accuracy of advice and information provided, the Proprietor. Publisher, Editor or Writers cannot accept responsibility for any damages, inconvenience or injury whatsoever that may result from incorrect information. The views expressed in this publication are not necessarily those of the publisher or its agents. 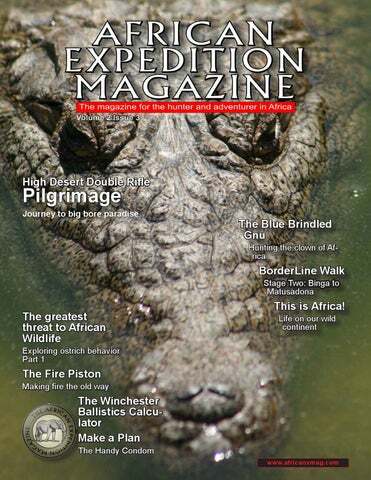 African Expedition Magazine assumes no responsibility to return graphics unsolicited editorial, or other material. All rights in unsolicited editorial, letters, emails, graphics and other material will be treated as unconditionally assigned for publication and copyright purposes and material will be subject to African Expedition Magazineâ&#x20AC;&#x2122;s unrestricted right to edit and editorial comment. 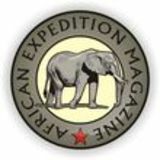 All material and/ or editorial in African Expedition is the property of African Expedition and/or the various contributors. No part of this magazine may be reproduced without the prior written consent of the Publisher. Hear the magazine! 1) In Adobe Acrobat, choose View>Read out Loud>Activate Read out Loud. This magazine is a radical departure from normal magazines. Of course, it is a superb-quality printed magazine. But you can also get it on: •	The web •	PC •	Laptop •	PocketPC •	PalmPilot and many others All you need to do is to copy the .pdf file to your PDA using the synchronisation software provided with the device. For more assistance, contact your supplier. Jump directly to articles On the contents, just click on the article to jump straight there. To jump to pages or articles, click on one of the icons on the right in Acrobat Reader. You also get a scaleddown version on your mobile phone. Just point your internet-enabled mobile phone to mobile.africanxmag.com and select the issue you want to read or download animal call ringtones. You can also order a printed copy (in color or black and white) of any past or present issue. The green circle gives step-by-step instructions for common features. This magazine is fully web-enabled. Note: Make sure you have the latest version of Acrobat Reader installed. To update, choose Help>Check for Updates in Adobe Reader. 60 odd was never going to be enough. As it was, we made a fine effort. Stumbling over rocks and breaking from the mopani with arms wind-milling frantically, we were just in time to see the speedboat draw level with our position and then flick past. It was about a hundred meters out and its occupants never even looked in our direction. What made it all the more frustrating was that we recognized the boat to be a Parks vessel, and they would definitely have stopped had they spotted us. Jephita and I looked at each other sadly, spent a minute appraising the immediate surrounds even more sadly, and then began trudging back towards our hastily abandoned backpacks. The day was fast drawing to close and we needed to find a campsite pronto. We had soon located a suitable campsite on a low bluff overlooking the river, and were making our way wearily to the water’s edge, to fill our containers. And then suddenly, miracle of miracles, another boat came up the river! And this one was chugging, not streaking. Bobbing my head about and getting glimpses of the boat through the trees, I saw that it was a pontoon type vessel Small crocs in th with about eight white e Sengwe people on board. Telling Jephita to lay low – folk are decidedly edgy about armed Zambian poachers in those parts – I walked from the trees as the boat drew closer and raised my hand in greeting. The people on the boat spotted me immediately and there was brief, muted dialogue, before the driver swung the boat towards the bank. I waved again and called out ‘hello’, and conversation ensued. Before the boat reached land, the ice was broken and everyone had been fairly well briefed as to what the Borderline Walk was all about. As can be imagined, I never tire of filling people in, especially when chancing upon them in the most unlikely places one would expect to find a man on foot. Nor do I ever tire of witnessing their reactions. Some are disbelieving, some are impressed and some are indifferent. Most are interested and fire away with the questions, and the people on the pontoon were no different. The morrow brought about what was arguably the most grueling day of the Borderline Walk thus far. Bearing in mind that, as I write, we are about to leave Kariba and tackle the lower valley. In a physical sense, our first day in Chete could be favorably compared to the day after we crossed the river Gwaii. I say Chete was worse than the Gwaii, though Jephita maintains that both areas were similarly taxing. I reckon we have covered four areas that are in contention for top sweat-shedding slot: the thirty kilometer stretch along the river directly below Victoria Falls, the country surrounding Batoka Gorge, the area flanking the Zambezi/Gwaii junction, and the first day in Chete. We were up and away at dawn and immediately into the hills. We would remain in the hills throughout the day. At first we tried working hillcrests, valleys and passes, a couple of kilometers from the water, and for a while it worked, but the terrain became increasingly hostile and we found ourselves zigzagging about, sweating buckets but not making much headway. By midmorning we had had enough of plan A and made our way down a gully to the lakeshore. seemed. And no, I don’t believe it is true that up is easier than down. Down is more dangerous, but it is not more difficult, specifically in relation to calf muscle usage. Yes, I have some now – calf muscles that is. They reappeared after Chete, after many years absence. As was the case in Sijarira, we saw little game in the south-western half of Chete – a few kudu, a few klipspringers, the odd croc and hippo and nothing much else but birds. We did come across the extremely fresh trail of a lone dagga boy, but besides that there was no recent sign of big game. At the time, I put it down to the extreme terrain and lack of vegetation, but I was to change my tune in the days to come, when we passed through country that should definitely be populated by wildlife and was not. we meet as soon as possible. More effort is put into winning particular people over, as is the case with safari camp chefs, for example. At Chete camp we struck pay-dirt fast and were soon chewing on hunks of fresh bread and butter, and sipping hot, sweet tea, whilst reclining on the lawn beneath a shady tree. We ended up staying two nights at Chete hunting camp; ostensibly so that I could do some writing, but actually to recover from the pounding our bodies had received the previous two days. Our hosts at Chete were professional hunters Derek Adams, Richard Schultz and Gareth Stockil. It was with mutual astonishment that Gareth and I discovered, after hours of conversation, that we are actually second cousins! Another pleasant surprise for Jephita and me was that our good friend from the lowveld, Clever Chauke, was in camp, tracking for Richard Schultz. It is amazing who we bump into on the Borderline Walk. Chete Parks post were only en route by mid-morning. Our destination for that day was Siantula Parks post, on the Luizinkulu River. Although the Luizinkulu is a full day’s march from Chete Island, the country is much tamer than in Chete south and we were confident of reaching there by nightfall. Unfortunately, we took a wrong turning at a hunting road intersection late in the day, and as evening loomed found ourselves on the lakeshore at a point we had hoped the Siantula post would be, but was not. As it slowly dawned on us that we had blundered, we heard the sound of an approaching vehicle. The occupants of the vehicle were none other than Gomez Adams, his clients and hunting crew. Gomez wasted no time informing us that we were way off track, and then offered us a ride back to where we had made the wrong turn. We accepted gratefully and, a short time later, were on the correct road to Siantula, eventually arriving there well after sundown. Just before dark, we were a tad surprised to see a small herd of buffalo crossing the road in front of us. Other than one dagga boy close to Victoria Falls, they were the first buffalo we had encountered the entire journey. by a stiletto snake, at the very spot we had visited that afternoon, where the Sengwa camp used to be. I told him about the biting, but my Shona is not good enough to have effectively described the results of the bite - my English is not good enough to effectively describe the results of that bite! I told Jephita about how the empty plains we had crossed that afternoon used to teem with game – black with buffalo, as far as the eye could see, hundreds upon hundreds, thousands….Elephants walking through camp in the evening, lions on the shoreline intimidating our contract reed cutters…. How much game there used to be at Sengwa. And then the storytelling changed location as I spoke of being sent into the The Sinamwenda escarpment with a land-cruiser, a few guys, tools, food and instructions to build a fly camp, open roads, conduct antipoaching patrols, etc. How carefree, uncomplicated and adventurous life was then, and how nostalgic I became that night. Nostalgic for the good old days, when the system did work at times and the Sengwa plains were teeming with wildlife… This land has been brutalized in recent times, but contrary to what the skeptics and defeatists would have one believe, the damage is far from irreparable. The land and the bush are still there, and it is the duty of all Zimbabweans to actively assist in returning the game to the Sengwa floodplain. Mark Fourie kindly offered us the use of a speedboat and driver the following morning, to cross the vast Sengwa mouth. Before leaving, I enjoyed a cup of tea and a short chat with Mark, catching up on news about my old school friend Carl van der Riet and life at Sengwa. It was with sorrow that I learnt from Mark about the passing of Mr Rupert van der Riet. Rupert van der Riet was a giant in Zimbabwean hunting circles, and those in the industry will remember him with only admiration. The Sengwa mouth is certainly ranked as one of the most expansive ‘mouths’ we have crossed thus far. looked after at Tashinga by ecologist Paul Chikombe and senior ranger Munyaradzi Tapesa, as well as every other man there. We were given the go ahead to camp wherever we liked, and I was allocated an office in which to get on with my writing and photo sorting/posting. Most comfortable and content we were at Tashinga. On the first day, that is. packed with Parks personnel, and I knew immediately that there was a problem. It was with great relief that I saw Jephita alighting from the vehicle, but as he approached it was evident that he was extremely disturbed. Jephita had a terrible tale to tell. The BorderLine Walk is in support of antipoaching efforts for Black Rhino in the Savè Valley. Initiated by Hunters for Zimbabwe, the walk will be 3066 kilometers long: 813 kilometers along the Botswana border, 797 km. along Zambia, 225 km. along South Africa, and finally 1231 km. along the Mozambique border. The BorderLine Walk will be widely covered by the media and progress will be published on the African Expedition Magazine and tracked on Google Earth. t some point in their career, all serious big bore shooters and/or hard-core safari hunters will make a pilgrimage to the high deserts of California, looking for the shop of Butch Searcy, and looking for arguably the best deal on a custom double rifle on the planet. B. Searcy Company is headquartered in the small desert community of Boron, California, about 100 miles northeast of Los Angeles. Located in an old WWII Quonset building, just across the road from Edwardâ&#x20AC;&#x2122;s Air Force Base, Searcy is ready to kit-up and custom fit a double enthusiast with a custom double barreled rifle in any caliber they are willing to pay for. Butch offers six grades of double rifles: four boxlock designs and two sidelock designs. The Field Grade is the entry-level boxlock, which as of January 1, 2010, will have a base price of $11,500. The next step up is the Classic boxlock at $18,000, then the Deluxe boxlock at $21,500, and the Sidelock at $22,000. Finally, there are the ultimate stoppers; a .577 Nitro Express double that you can have as a Boxlock or a Sidelock for $22,000 and $35,000 respectively (larger calibers available). All these rifles have multiple options and feature choices, the details of which can be best viewed at Searcy’s website: http://www.searcyent.com/new_ dr.htm Standard calibers offered are the .375 H&H Flanged Magnum, the .450-400-3” (.411”), the .450 3¼” Nitro Express, the .450 Nitro Express, the .470 Nitro Express, the .500 Nitro Express (3” and 3 ¼”), the .577 Nitro Express, the .600 Nitro Express, the .700 Nitro Express, and the incredible 4-Bore. The 4-Bore double rifle starts at $85,000. Other calibers are available on request for an additional charge. Only the Searcy double rifle can be described as an ‘All American’. Although other available doubles may be assembled in the United States, they are built on German or Italian actions. The Searcy rifles are machined right here in the States and have Anson and Deeley style receivers, with double Purdey bolting and top extension, and are CNC machined out of 4130 chromoly and 416 stainless steel bar stock into boxlock or sidelock configurations. Searcy’s doubles come fitted with monobloc constructed PAC-NOR barrels, and are topped with iron sights from New England Custom Guns. A second set of double rifle barrels in a different caliber will set you back a cool $10,000, while a set of 12 gauge shotgun barrels can be fitted for a mere $4500. Final barrel options include the choice of installing ejectors ($1000) or extractors (including rimless). All Searcy rifles come standard with a quarter-rib, which includes one fixed rear sight and a caterpillar front sight. However, rear sights with folding leafs are available options at the rate of: one fixed + one folding leaf $400, one fixed sight + two folding leafs $500, and one fixed sight + three folding leafs $600. The final iron sight option is a front ‘night sight’ for $225. Although not usually recommended for the larger ‘stopping’ caliber rifles, scope mounts are a popular option for the large medium bore caliber rifles, where a good quality riflescope can be very useful for long distance shots at plains game. Two styles of mounts are available; the renowned Talley rings and bases for $595 or the European style claw mounts for $2900. Butch likes to keep an extra barrel or two in stock. Notice Butchâ&#x20AC;&#x2122;s look when I mentioned something about swapping ad space for a double! Lisa Johnson handles most of the reloading chores at Searcy, but there are few chores there she does not handle as well. brass now in production, getting .450/400 brass may no longer be a problem. When I questioned Butch and Leo on the desirability of a .375 Flanged barrels vs. a set of barrels in .450/400, we got into the other issues which had led them into choosing the .375 Flanged. The deciding factors were; there is a large variety (and ample supply) of .375 caliber bullets available for handloading, and with its longer range and somewhat flatter trajectory, the .375 Flanged is more versatile in the field than the .450/400. Craig Livingston told me and Butch he was boning up on the latest CNC techniques! However, the final reason for going with the .375 Flanged was that the .450/400 simply was not a big enough step DOWN in power. With its significant reduction in recoil, the average person will find the .375 Flanged not only more pleasant to shoot, but more manageable than the .450/400. Even for someone like Leo, who has put over 5000 rounds through his .470, and over 2000 rounds through the .375 Flanged barrels, tailoring the amount of recoil down to more manageable levels was a major point. On a practical level, if the rifle is pleasant to shoot, more practice is done on a regular basis. That way, the shooter develops familiarity with the weapon, muscle memory is enhanced, and when it comes time for serious use, fear of recoil becomes a non-issue, with handling and reloading the rifle become second nature. On the other end of the spectrum are the extreme big bore double rifles that Searcy makes, which start with the .577 Nitro Express and include the .600 Nitro Express, the .700 Nitro Express, and the massive 4-Bore. If you are not completely insensitive to recoil, the best thing you can do is stay on the porch, because recoil is where these big dogs run. As a bonus for traditionalists, Butch also offers the dynamic duo of stopping calibers: the .450 Nitro Express and the .450 3¼” Nitro Express. These cartridges give the handloader the ability to use relatively cheap, and easily available .458 bullets to make premium ‘full-house’ hunting rounds, as well as use cast lead .458 bullets for ‘reduced load’ practice rounds. It is not a problem if you own a modern rifle like a Searcy, but if you are going to handload full-house loads for any of the old original .450 Nitro Expresses, you should have a good gunsmith check the rifles out thoroughly, and remember to keep the pressures low. Inexpensive bullets and low recoil practice are an attractive combination of features in favor of choosing these calibers. The 450 Nitro Express calibers were the first of their kind, and when it came out, it was viewed by many experts as the best in its class for hunting the most dangerous game. Guess what? It still is. Having a custom double rifle maker like Searcy working right here in our back yard is a boon to the American customers who are in the market for a brand new double, and want something better than an ‘out of the box’ factory rifle. Not only are his prices competitive with the factory doubles from Germany and France, but you are dealing with an honest US gun maker who is not only easily available, but willing to back up his product, and in most cases offer quicker delivery times. If price is no option, and sending your rifle back to England for repairs is not inconvenient, then it is hard to argue with anyone who wants to buy a Holland and Holland or Westley Richard. However, in my opinion there is a lot of value for the first time double rifle owner to get into the game at roughly 25% of the big name English rifle makers entry level prices for doubles. But at the end of the day, it is up to the individual buyer to weigh their own needs and opinions against what is available on the market today, and to decide for themselves what rifle brand best fits their budget, investment strategy, and expectations. We are lucky to have the choice of a wide range of styles in double rifle design and cosmetics available in the in the 21st Century marketplace. It wasn’t that long age when all the firearms pundits were convinced the double rifle had seen its last safari, but in a relatively short period of time, and despite the recent downturn in the US economy, double rifle sales have rebounded from their ‘death’ in the 1960’s, and looking at their sales in the long term, we are in the strongest marAlan Bunn is a ket for double hunting publication rifles since veteran with a BA World War II. Degree in Journalism from the University of Georgia. He hunts Africa regularly and is an avid hunter with rifle, pistol, shotgun, and bow. any countries in Africa are being held to ransom in terms of wildlife management issues by the international world in general and animal rights groups in particular. This issue is of such current relevance that it cannot be glossed over in one article so this will be part 1 of a three part series. The greatest threat to the future of wildlife (other than animal rights activists) is loss of or fragmentation of natural habitat through any land use that changes its natural character. One salient fact emerges when things are looked at in a rational way – the animal rights movement is BY FAR the biggest threat to wildlife in Africa and beyond (Thomson, 2006). Lets examine this issue carefully and pragmatically. If habitat provides the basic requirements of enough food, water and cover, animal populations will increase until the population reaches a point where it begins to impact negatively on the environment. Before the days of fences when wild animals had the option to roam freely they would migrate to new areas and so allow grazed and browsed areas time to recover. Most nature, national and provincial reserves and private game ranches are fenced, so confining the resident wildlife species to a given area. Sound, logical and intelligent wildlife management dictates that, before resident game populations begin damaging habitat they must be reduced to below maximum carrying capacity. The wildlife manager has four options available to reduce the excess animals. They can be captured and translocated to some other suitable area, they can be culled or harvested (yes there is a difference) and the products (meat, hides etc.) utilized, or the surplus animals can be made available to sport or recreational (biltong) hunters. It must be understood that where this is used as a wildlife management tool and done in the interests of protecting habitat it is absolutely justifiable morally, ecologically, and pragmatically. What the animal rights movement fails to grasp (or refuses to) is that the greatest threat to wildlife (other than themselves on which I will elaborate further) is loss and fragmentation of habitat. What these people just don’t appear to be able to grasp is that most forms of land use including eco-tourism , forestry and agriculture (growing vegetables for all the vegetarians) uses up wildland habitat without which wild animal populations cannot exist!!! (See Figure 1). The reticence of animal rights activists to accept these salient facts must make their motives suspect to say the least – I might even go so far as to say, without being melodramatic, sinister. The hard questions We are now compelled to ask ourselves a few questions in the African context: ●● What justification is there for setting aside undeveloped wildland with the long term intention of keeping it wild and undeveloped? ●● Can we justify “locking resources away” – i.e. not to be utilized – from people? says of an animal or plant: What good is it? If the land mechanism as a whole is good, then every part is good, whether we understand it or not. If the biota …has built something we like but do not understand, then who but a fool would discard seemingly useless parts? To keep every cog and wheel is the first precaution of intelligent tinkering.” Then there are the animal rights activists that say that animals may not be used in any way. If they extend this argument to its logical conclusion then they should not use any plants (vegetable / fruit) for food either. They have no problems with being vegetarians. What they refuse to face up to however is that agriculture also removes natural habitat and deprives wild animals of a place to live. ●● Why is it that there are significantly more wild animals on private land in South Africa now than there was more than a century ago? “No, no you may not – you may not in any way utilize animals or their products consumptively!” Just what kind of future does this unenlightened and extremely naïve individual think wildlife will have in the greater The answer to this is that landowners recognized the Africa? Is this not one of the reasons why Africa is utilitarian value of wildlife and chose to ranch with faced with a pandemic poaching problem? Is it not wildlife in preference to other land uses. It was a reasonable to assume that a human being will do just financially viable and lucrative way of “farming”. The about anything to provide for both himself and his ranches paid and income was generated through family with the food and water they need for survival? both “non-consumptive” (eco –tourism) and conI believe it is. And if it means that he will have to kill sumptive (live game sales, venison production and wildlife “illegally” to survive is he not justified in doing hunting) utilization. so? I cannot see why not. Both you and I and the Eco-tourism is in fact not “non-consumptive” but animal right’s activist would do exactly the same and more on this in another article. It is a fact (not conjec- the animal right’s activist (usually from an affluent ture) that, by far the greatest income was generated or privileged European, Scandinavian or American from hunting. background) is, again I say, a hypocrite because he, or she, has (1) never known true hunger and (2) Now logic tells us that for long as it is financially utilizes natural resources every day of their lives. rewarding for landowners to ranch with wildlife there Because they are vegetarians makes them no less is incentive for them to continue doing so. Taking “guilty”, insofar as they make using animal products away this incentive would lead to the collapse of the a “crime”. Vegetables need place to grow – which at wildlife industry and wildlife habitat one time used to be wildlife habitat would be sacrificed to development before it became a vegetable (or or some alternative form of land use Can we justify locking fruit) farm. which will lead to loss of biodiversity (i.e. loss of wildlife). It does not take a rocket scientist to understand this and the irony of the situation is that the animal right’s groups will be the cause of it. That is why they are such a threat to Africa’s wildlife. trail leader, rated field guide instructor and the author of many leading articles on the REFERENCES subjects of tracking, guiding, bowhunting Thomson, R. 2006. Manand survival. Cleve has unrivalled experiaging our Wildlife Herience in wildlife management, game captage. Magron Publishers. ture and hunting, both with bow and rifle. On Target, By Christian Le Noel On Target: History and Hunting in Central Africa: Christian Le Noel. Limited Edition, signed and numbered. 256 pages, black & white photographs. Not Indexed. Trophy Room Books, Box 3041, Agoura, CA 91301. Copyright, 1999. History is always a quandary. It is at once the dust bin of civilization while also the ointment on our need to establish ourselves as having progressed beyond the stone tools of early Homo erectus. Through the lens of history we collect the indefinable bits of information that ultimately provides us a sense of triumph over evolution’s uncertainty. That’s why any book of history is important to us—each chapter is a telescopic lens viewing the past. Sometimes, however, those history books masquerade as an exciting adventure tale that stays in our memory long after the last chapter. That’s how I felt after reading Christian Le Noel’s On Target: History and Hunting in Central Africa. This is a book that can read for historical information or purely a good read for relaxation. This is not a newly released book, but one that has maintained itself on the publisher’s book list and is deserving of another, more critical look. On Target was published by Trophy Room Books in 1999 and I have no idea what the original reviewers wrote, which is just as well as I tend to ignore their comments because many traditional outdoor book reviews are approval stamp rewrites of the book’s dust jacket or press release. the two of them, author and reader, were sharing a campfire and sundowners. Le Noel begins his narrative with the place and time of his birth (Normandy, France, December 18, 1938) and, as with many of the world’s post World War II adventurers, his need to see beyond the horizon of the English Channel was fueled by adventure and travelogue novels of the late nineteenth and early twentieth century. His reading must have played a role in his decision at age twenty to join French army. The Algerian rebellion was in full force and he was sent to fight on the African continent. After the war he snagged a topographer job in Cameroon and he discovered the world of central Africa. Armed with a surplus M1 carbine that he was issued to protect himself and his native workers from the misfits that roamed the African bush he also used the rifle to begin providing the workers with fresh meat. Hunting soon dominated his activities but he had to learn how to hunt in Africa, a transition that was helped along by his tracker. for work he went hunting on the Ngaoundaba Ranch where he met the legendary PH Henri Eyt-Dessus. The hunt and Eyt-Dessus nudged him farther along the path that would take him to the role of professional hunter. This background is important because Le Noel weaves an intriguing narrative of personal history as a PH with the region’s history. In “Part One” he explains how early twentieth century abuses nearly destroyed Cameroon’s game populations and the successful efforts to counteract these abuses through the Counseil International de la Chasse under the leadership of Henri Eyt-Dessus. Another side of the African bush is the cheapness of life. Le Noel doesn’t avoid the gruesome and one story he recounts is the 1974 murder of three buffalo hunters by Cameroon poachers. He writes of other bush tragedies, which underscores the reality that in the poacher’s war against wildlife human life is expendable. stream of tourist hunters flowing in and out of Chad. Le Noel chronicles this safari industry, explaining how the PHs kept a wary eye on the politics and were keenly aware that “something” was about to spill out of the country’s population and into the safari industry. Few authors can match Le Noel’s power of understatement; his recounting of an early, savage attack on a medical team was a grim harbinger of what was to come to the troubled region. Before Le Noel and his wife were forced out of Chad he had developed a name for himself as a professional hunter so that when he reached the Central African Republic he was able to land on his feet and continue in his career. The CAR years are the foundation for two-thirds of On Target, and the entire text is a richly woven tapestry of characters that includes clients, guides, professional hunters and government officials, both corrupt and honest. war time sailor in Briton’s Royal Navy, to a farmer in Kenya, and his evolution into a leading PH of the second Safari Golden Age—the post war years of World War Two. This age came to a dramatic end when the southward march of Marxist revolutions altered Africa’s political landscape. Northcote’s memoir, a 400 page tome, provides an intimate look into the world of the professional hunter of these years and the book is worth reading if for no other reason than the stories about the men and women, who were the era’s characters. Northcote has written what I believe is an essential history of this second golden age. I base this position in part on my research that contributed to my thesis, Peter H. Capstick And The Tradition of The Hemingway Hero of The Genre of Outdoor Literature. (To my knowledge this is presently the only critical study of Capstick’s work and I would be very interested in learning of any other CapThroughout my reading stick studies. I encourage any of On Target I was never able reader who is aware of a study to decide whether the book to contact me by email using is only as autobiographical the email address at the end of account of the author’s adventhis review.). Additionally ongotures or it is more an historical ing studies of our genre, espeaccount of the characters who cially the philosophy and history drifted through the region. In of outdoor literature, continue to the end, I decided what is truly provide me with a wider perimportant is the book accomspective of outdoor texts and I plishes something important have discovered that some of for the Africaphile—it opens CLICK to BUY the work published in the past up a region that for many of thirty years is far more imporus has remained obscure. Today, with the clash tant than either the author or between radical religious zealots and governments publisher may be aware. From Sailor To Profesthreatening more violence in this region of Africa, it sional Hunter is just such a work and is deserving of behooves the thinking person to know the region’s a much more detailed investigation! The characters history. Le Noel has, I believe, skillfully blended this who march across the pages often provide intimate history with his own to provide every reader with an and always informative records of the people and insight that cannot be overstated. events of Africa’s Second Safari Golden Age. harbinger of change, confirming Bartle Bull’s text. Northcote relates the story of his last professional adventure—a photographic safari that becomes, for him, a personal nightmare. Perhaps it is a final proof that nothing will ever be the same and in his final paragraph Northcote writes an unknowing contradiction. “My nephew Roger Hissey (Mike Hissey’s son) asked me to take him on a buffalo hunt in August, 1997. If it comes off it will be my last safari” [Underline emphasis, mine]. The safari, for all intents and purposes, has changed into a hunt. I am not sure what date future historians and the literary critics in the outdoor literature genre will select as the end of the Second Safari Golden Age, for my money it is the infamous 9/11. Northcote’s book predates that attack on America but his closing sentence is its own warning that change has come; all that the age needed was an event to mark its passing. I do not doubt that Africa will maintain its siren song in the hearts of most hunters and there will always be men and women willing and able to make the trip from their homes to Africa and a new dimension of their lives. The new generation of super passenger planes will deliver this generation of hunters to Africa and they will bring with them their vision of the ethics that defined hunters of the golden eras. The new generation will hear the siren song in the pages of historical narratives such as From Sailor To Professional Hunter. From that generation I hope a new John Northcote will emerge and inspire an unborn generation to hear that same song and each epoch of our civilization will also produce another Safari Golden Age, different yet connected, just as Northcote’s age is connected to the first. glg Readers may contact the author at: ggeerauthor@yahoo. com and visit his blog, The Thinking Hunter at http://galengeer.blogspot.com. Galen L. Geer is a former United States Marine Drill Instructor and Vietnam veteran. A professional outdoor hunting, shooting and gun writer, he has published 2000 magazine articles. He has been a contributing editor to Soldier of Fortune magazine for thirty years and is the author of seven books. t’s amazing that centuries before scientists such as Boyle established the ideal gas law, or the idea of a diesel engine was conceived, the fire piston was being used in Southeast Asia, Indonesia and the Philippines to start fires. The principle of heating air by compression and igniting tinder was accidentally “re-discovered” much later during the early 1800 in Europe by a French airgun manufacturer, who, when firing an airgun in the dark observed light being emitted from the barrel. This led to the development of the “fire syringe”, which was then widely used in Europe until the first wooden matches become popular. The basic working of the fire piston can be explained by using Boyle’s ideal gas law formula and the diagram shown below. Boyle’s ideal gas law: When a fixed volume of air is quickly compressed by a piston in a cylinder the volume (V) is reduced and the pressure (P) increases significantly. The number of moles of air (n) and the universal gas constant (R) is unchanged, thus most of the work done by quickly compressing the fire piston is converted into heat which increases the temperature (T) by at least an order class. Ensure that the piston fits snugly into the cylinder, is well lubricated (use Vaseline) and that air does not escape past the sealing ring. To check this, push in the piston - it should feel like freely pushing against an air bubble. When you pull the piston out, it should make a popping sound when leaving the cylinder. This high air temperature results in the tinder fungus reaching flash point, causing a small local explosion in the cylinder. If the piston is quickly removed, and the tinder fungus exposed to oxygen, ignition point and thermal runaway is reached leading to the formation of an ember, ready for you to start a fire with. into the form of a birds nest, as per photo (a), and place a piece of charred cloth, shown in photo (b), in the centre. You are now ready to make the red hot ember with the fire piston that will be used along with the charred cloth, in the tinder nest, to finally start the fire. You could also light your pipe with the ember. Air gets very hot when compressed under high pressure. A good example is the heat generated when using a bicycle pump. When in the veldt, the hemp and charred cloth can be replaced with fine dry tinder that is available. Step 3: Let’s get going, as per photo break off a small piece of tinder fungus, just large enough to fill the hole at the front of the piston. Push the piece of tinder fungus into the hole, and break it up into small pieces with your nail. Ensure that the tinder fungus is well seated, but not too tight, as shown in photo. Ok, so you don’t know what tinder fungus is. It is also known as Amadou, Hoof fungus or scientifically as Formes fomentarius. It has been used for centuries to help start fires. The fungus is prepared by slowly boiling it in urine for a view days. Yes believe it or not, the urine boiling results in the saturation of the fungus with saltpetre (you can also boil the fungus in potassium nitrate). The fungus is then dried, cut into thin slices, and hammered flat with a piece of wood and is now ready for use. True tinder fungus is also known as Clinker fungus, in Russia as Chaga or scientifically as Inonotus obliquus. This fungus normally grows on live birch trees, has a hard black exterior, and a softer red-brown corky interior, which is used as true tinder fungus. When smouldering, the true tinder fungus gives off a lovely aroma. The flash point of true tinder fungus is typically 280 °C which makes it ideal for use as tinder in the fire piston. Step 5: Place the glowing ember onto the charred cloth in the tinder nest and lightly blow oxygen over it igniting the charred cloth. Fold the tinder nest over the glowing charred cloth and continue blowing air into the nest. The tinder nest will start smoking. Blow harder and harder. Don’t stop until the tinder nest suddenly bursts into flames as per photo (c). Yes, you’ve done it ! Flames to start a big fire. All you have to do now is to put this burning tinder nest into your pre-prepared fire pile and that’s it, a fire started with a fire piston. The fire piston is an elegant age-old way of making a traditional fire, which will give you years of good service. Kids young and old are fascinated by its working. The fire piston is a practical and efficient way to start a fire in the veld. Note: You can purchase a complete fire piston set, as used in the article above from Gavin “Slow Match” Margrate at e-mail address plumcrazy@absamail.co.za or phone him on +27 (0)82 469 3236. Thanks to Dr Riana Geschke for the photos taken. My sidekick, Wessel Croukamp who assisted with the fire making. Dr Igor Gutman “Wild African Man” who supplied the true tinder fungus (Chaga) from Russia and Dr Peter Mallon for determining the flashpoint. The Winchester Ballistics Calculator Winchestersâ&#x20AC;&#x2122; award winning ballistics calculator is considered the most advanced ballistics calculator on the market, using cutting-edge technology to provide ballistics information for shooters and hunters. The Winchester Ballistics Calculator allows users to choose their type of ammunition and compare up to five different bullet types with easy to read and high-tech ballistic charts and graphs. Enter specific conditions like wind speed and outside temperature, adjust zero marks for sighting in and print out the ballistics of your favorite load. Let the Winchester Ballistics Calculator help improve your shooting ability. The Winchester Ballistics Calculator is powered by Microsoft Silverlight, a cutting-edge technology that enables us to provide rich internet applications through the web. If you do not have Microsoft Silverlight installed, you will be prompted to install it the first time you launch the ballistics calculator. This is a one-time installation. Here in Africa, we Boers are pioneers and survivors - and we always make a plan. We got Wallace to share some of them with you. Here is the first in his new series. The Handy Condom A condom is a multipurpose device- and it could be one of the most useful items in your survival kit. You already know about the primary purpose – but here are some more: ●● Put anything that you want to protect from dust or water (like a cell phone) in it and tie a make a knot in it ●● Put the condom in a sock or a hat to serve as water container. Fill it up - it can easily hold two or more liters.. ●● The lubricant on the condom helps to moisturise for dry lips or abrasions. ●● Pull it over the your gun barrel to keep rain, dust, mud etc. out of it. ●● A condom that is pulled over a finger with an incised wound looks stupid, but keeps both flesh and wound clean during skinning process.. ●● When nature’s gentle call becomes a demand in an unexpected place - like in a small plane - it is a handy urine holder that you can safely make a knot in and keep it to discard it later ●● It is also very handy in a vehicle. Wind it tight around a leaking or burst pipe or use as electrical insulation if there is no insulation tape available. Its elasticity can be used as vibration inhibitor, tieDr Wallace Vosloo down or a spring. is an Engineer and ●● You can even make a fire with a condom. Put half a cup of water in condom and press water into a tight in a ball until the wall becomes thin and transparent. Use the tight stretched wall as a magnifying glass to start the fire. ●● Yes, and then they say in the bad old border war days the guys put brandy or whiskey in a knotted condom hidden in water bottle. Just a puncture with a sharp bayonet, give it a good shake and the war seemed not so bad. Well, there you have it: a couple of good reasons to explain to your wife why you carry a condom in your bag. Scientist by profession. His family has lived in Africa since 1696 and he has a deep love for the continent. He is a practical outdoorsman and loves traditional hunting, axe and knife throwing, longbow shooting, black powder rifle- and cannon shooting, salt and fresh water fly fishing and tracking. The art of survival is Wallace’s main field of interest and his passion is to transfer these old forgotten skills to young hunters.